This giveaway is now CLOSED. Thanks so much to our wonderful sponsor Ryn Shoes! We look forward to working with you again! The winner has been notified and upon confirmation, follower name will be posted both here and on our homepage. Remember: There are great giveaways active on the upper right hand side of the page! We couldn't think of a better way to 'kick off' our new 'Slip Into Summer' special feature than with shoes of course! And not just any shoes, but shoes that are FDA approved as a medical device! In 1989, Ho Hyung Lee, was forced to leave his steady job at a sneaker factory due to a seemingly incurable knee problem dating back to childhood. His desire to recover and get back to work, prompted him to re-engineer the athletic shoe to be healing as well as functional. Twenty years later, the company founder, is not only pain free and in great shape, but has also brought the concept to America, Europe and the rest of Asia in the past year. The expanded collection, which also includes sandals and office-friendly walking shoes for men and women, has quickly become a celebrity favorite, and for very good reason! I have seen 'shape' sneakers on TV and have seen people sporting them and will admit to being a bit intimidated by the whole thing. I thought surely they'd make me trip over my own feet, and I wondered how they would work during those times when you are just plain forced to stand still like on a checkout line or waiting for the light to change when I was out and about in the city. I was immediately surprised by just how comfortable these are. I have never owned a pair of shoes that did not require a bit of a 'break-in' period, these were comfortable as soon as I put them on, and I have a very high instep and practically zero arches so having them feel comfortable for me after slipping them on alone, is indeed quite a treat! I have been working on a personal overhaul both inside and out, and health and overall fitness and wellness has become increasingly more important to me. These shoes have helped me tremendously in an astonshingly short time to move closer toward achieving my personal fitness goals. Ryn shoes has helped me to begin improving my fitness in a way that has been quite noticeable, clothes are fitting much looser and friends and family have all asked if I'm losing weight! PERK! 1. The RYN AIR TUNNEL and seven layer structure promotes energy return & stability... in addition to strengthening, toning and aligning. 2. The RYN AIR TUNNEL lightens the footwear weight as well as enhances its durability, cushioning and footstrike/stability management effectiveness; keeps heel slippage to a minimum. 3. The RYN AIR TUNNEL can get wet and can withstand all sorts of exposure and usage. 4. The encapsulated RYN AIR TUNNEL technology offers maximum strengthening and toning for those consumers seeking to get the most workout out of their footwear purchase — executed on a stable, highly technical, supportive and non-eroding seven layer sandwich midsole/outsole platform. 5. RYN Footwear has outstanding quality as each shoe is hand made and goes through a vigorous quality control procedure in footwear's global development hub in Pusan, Korea. As a result RYN Footwear has great durability and longevity and does not require resoling. My experience with Ryn Footwear has been a positive one, I would highly recommend purchasing this shoe, it's a workout in a shoe that is an absolute God send for those with joint problems because it does NOT stress your joints. What I noticed immediately (aside from the fact that they were comfortable) is that they immediately made a tremendous impact upon improving my posture. As someone who is on my computer both day and night, my posture had become poor with time spent hunched over the computer, and as a complete ergonomic office makeover is not possible, I appreciate just how much my Ryn Shoe has vastly improved my posture. Improved Posture also helps keep your lungs expanded allowing you to breathe in more profoundly. I also find that the improved posture has helped to decrease neck pain which had been caused by my off alignment while sitting at my desk and angling between viewing the monitor and of course crooking my neck when answering phone calls so I could balance my phone and type at the same time while on the landline. Because I don't wear them every single day, I am still getting used to navigating the stairs with them on, and the sensation from long 'stops' (like super long lines at the Bank) where I am standing motionless for longer than normal periods of time. You really don't even think about them when you are running around, until someone stops you and asks about them of course! This was great for many reasons, because the only association I had with Bliss was of Spas and Spa Products, who knew they sold footwear (and shapwear to go with it) too? Ƹ̵̡Ӝ̵̨̄Ʒ - WIN IT! - Ascending Butterfly and our friends at Ryn Footwear and blissworld.com would like to provide one lucky winner with the opportunity to win a pair of Ryn Shoes! Don't you just ♥ Ryn Footwear and Bliss World? I know I do! Ƹ̵̡Ӝ̵̨̄Ʒ - How to Win: (1) You must be a PUBLIC follower of Ascending Butterfly to be eligible for this and all giveaways. Indicate in your entry that you follow (if your 'comment name/user id' differs from your profile id, please let me know what name you follow under) and (2) Let's show our new friends at Ryn Footwear USA some love by 'Liking' them on Facebook, please 'Like' Ryn and then post on their wall 'Ascending Butterfly sent me to 'Slip into Summer' (this will be checked, if not completed, your entry can't be processed. (3) You must also leave your email address somewhere in your comment. (You can format it this way for security, example: ascendingbutterfly AT mail host DOT com, If your email is visible in your profile, just say so, that's OK! Even if you are a subscriber, if your profile is set to private and you don't include an email we have to disqaulify your entry. Please follow the easy 1, 2, 3 steps to winning! This giveaway is open to USA AND Canada residents who are 18 years of age or older and have a facebook page. No P.O. Boxes! Ƹ̵̡Ӝ̵̨̄Ʒ - Super Brain Buster Extra Credit - Identify at least 3 of the celebrities wearing Ryn in the photo on the very top of this post (hint: check out the RYN site and the celebrity fans section for some help with this one, and no I'm NOT linking you to it, you must do the 'leg' work on your own on this one!) put all 3 celebs in ONE comment entry. For every celeb on top of those 3 you can identify you can post a separate comment entry for even MORE ways to win! I 'Like' Ascending Butterfly on Facebook! Fab review- hope I win! I could really use these shoes! (1) I follow Ascending Butterfly via google friends connect as Nanette Olson. Walking 30 minutes a day for 5 days a week can increase your lifespan by more than a year and a half! How do i get the 5 extra entries? 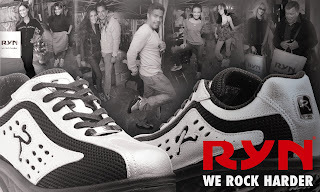 Corey Feldman wears Ryn shoes! Susie Feldman wears Ryn shoes! Melanie Griffith wears Ryn shoes! Jane Book wears Ryn shoes too! Nia Long wears Ryn shoes! Carolee Campbell (Hector Elizondo 's wife) wears Ryn shoes! Angelica Castro (Cristian de La Fuente's wife) wears Ryn shoes too! Alice Greczyn wears Ryn shoes! Marlene Forte wears Ryn shoes! Walking 30 minutes a day can increase your life span by a year and a half. Thanks! Three celebrities I can identify in the photo are William Shatner, Esai Morales, and Susie Feldman. Thanks! Another Celebrity it Tia Carrere. Thanks! Another celebrity is Nia Long. Thanks! Another celebrity is Christian De La Fuente. Thanks! Another celebrity in the photo is Alice Greczyn. Thanks! (3) My email address is ghostamongyou @ gmail dot com. I liked Ryn Shoes, strengthens, tones, aligns, stabilizes on facebook. I entered your 'Spring Into Bags' Special Feature - Win the CAMENAE 'Siren Mogano’ Leather Shoulder Bag! ARV $1,135 giveaway. Left a comment on your Today's Words of Inspiration - Change Your Reflection! I apologize for the previous entries - please delete the errors. Stacey Keebler,Jonathan Silverman, and Esai Morales. Daily vote for your outfit 'Yay4WkEnd' @ Macy's Fashion director. Thanks! You now have 82 votes. Good Luck! I am a google follower. I liked Ryn shoes on facebook and left the message. ok so i totally read the instructions wrong i'm sorry! Daily vote for your outfit 'Yay4WkEnd' @ Macy's Fashion director. Thanks! You now have 71 votes. Good Luck! 2. I like Ryn on facebook (ChristineFidance) and left your message on their wall. 3. My e-mail is in my profile. Daily vote for your outfit 'Yay4WkEnd' @ Macy's Fashion director. Thanks!